As a new Wealth Builder, there is really much competency to build up. You need to establish a process/system (3) based on a fundamentally sound wealth building method, be it trading, business investing, passive investing. You need to be steadfast (1) in your quest for wealth. But there are some things that clouds your judgement, mostly because we failed to set aside our cognitive bias, or we did not look at data impartially, taking a look at both sides of the coin. This is reference to knowledge being tainted (2). To couple with that, you are likely to stick to a toxic environment when you give yourself every opportunity to hear all the wrong things, or the wrong things and the right things, that you have a problem deciphering them (4). I decide to curate some of these supposed prevalent thinking and articles that explored them here. Most of all I hope it gives you a perspective of things that you thought it helps, or is the truth, making you question them and look into them more. For the novice investors, they would form a thinking that they have to follow intently to the market news in order to build wealth. Based on your methodology, that might not be paramount. In fact it could be rather hazardous. Josh Brown here highlights a peculiar observation of a media providing market news. The agenda why they put out news is perhaps to grab headlines, so that you will read it. Are they actually helpful at all? It depends on whether your wealth building methods depend on it. How is it that there is SUCH a big difference within a span of months! 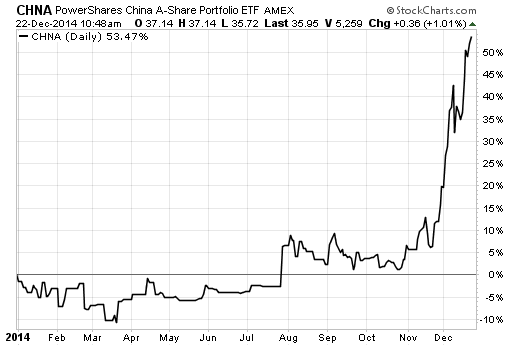 Now imagine if you are a novice investor thinking this is good for you, and make an informed decision on your portfolio based on that. You will be pulled all over the place. What about those Gurus that you see on Bloomberg, CNBC that were invited to give their market insights. What about those experts that writes investment newsletters or hedge fund managers that provided their views? Their views must amount to something right? 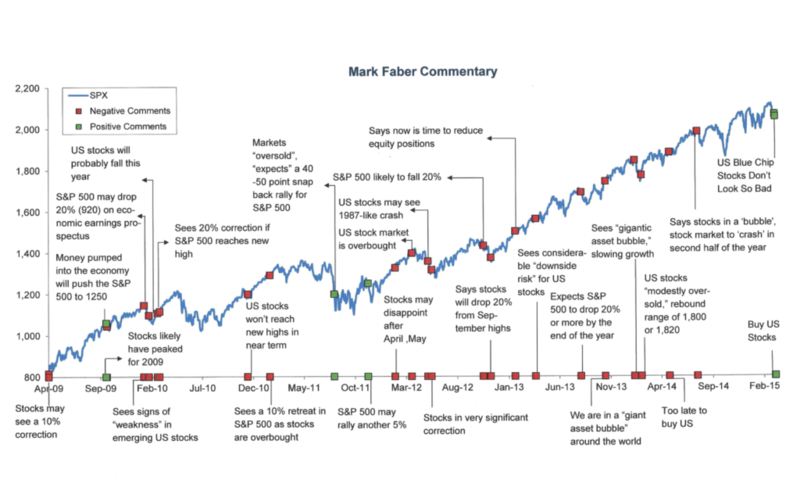 CXO Advisory ran an investigation of nearly 6,500 forecasts on the US Stock Market, offered by 68 experts, both bullish and bearish employing technical analysis, fundamental analysis or sentiment based. They did this since 1998 when they start ‘collecting’ gurus up till 2012 when they stop doing that. You can take a look at the report here. The report is interesting in that you can see at the bottom the gurus writing in to ask them to take themselves off the list. 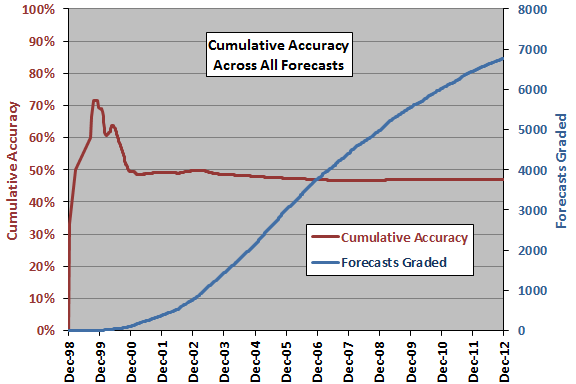 As the number of forecasts were taken, their accuracy normalizes to 50%. Most of them fell right to the average, only some extreme ones consistently do better or worse. 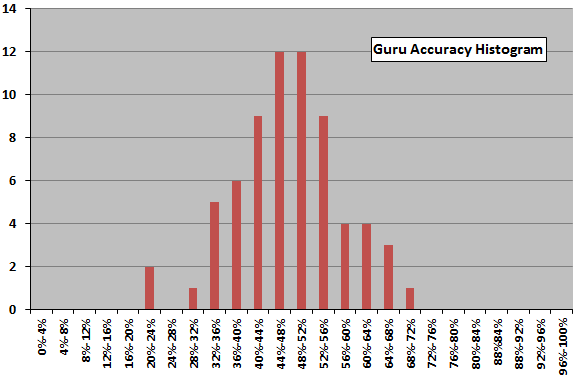 What is equally interesting is to read most of how the gurus try to defend their records. Tony Robbins is very famous as a self help guru that wrote numerous best selling books that help folks from all walks of life as well as important people such as Bill Clinton when they cannot get pass their troubles. He decides to write a book based on how the average folks can build wealth using Hedge Fund manager Ray Dalio’s method for an all weather portfolio. Right now is a time you might want to take some stocks off the table in the stock market. Especially if they are in manufacturing or retail or banking or god forbid homebuilding and housing . . . I would feel bad if I didn’t warn you . . . One of the biggest bubbles in history is blowing up now. This turned out to be terrible advice. The day that video was released, the Standard & Poor’s 500 Index closed at 1,121.64. Yesterday’s close was 2,051.80. Following Robbins’ advice would have caused an investor to miss a 90 percent gain, a near doubling of value. Some of the industries he recommended avoiding did even better. Some of his other statements were odd or simply false: Perhaps the strangest statement of the video was “Most investors over a 10-year period — 95 percent — lose money.” (There are plenty of other odd and inaccurate things in the 21-minute video). At the time, traders believed Robbins was passing along the views of legendary trader Paul Tudor Jones, who made a fortune being short the stock market ahead of the 1987 crash. Jones had lost his mojo, and had turned to Robbins for some help. I give Robbins credit for leaving that video up on his site. Plenty of less-ethical gurus would have taken it down, hoping it would be forgotten. Consider David Tice, who this past August warned of a 60 percent market crash. That might be scary, if you were unaware of the fact he made the same forecast in both 2010 and 2012. The first call had something to do with book value (“Federated’s David Tice Sees ‘Huge’ Potential For Decline“). The second was that “Gold Will Surge To $2,500 And The S&P 500 Will Plunge To 1,000.” Meanwhile, gold has fallen by a third and the S&P500 has rallied to all-time highs. Perhaps this helps to explain why Tice’s Prudent Bear fund has trailed the S&P 500 by a huge margin. I would be remiss not to mention what is perhaps the worst forecast of recent years: Meredith Whitney’s disastrous prediction for municipal bonds. This was a prediction so bad it all but ended her career as an analyst on Wall Street. She now runs Kenbelle Capital, a midsize hedge fund. Despite the abysmal track record of almost all forecasters, the news media still loves them. It has air time and pages to fill and seems little concerned about giving space to money-losing prognosticators. 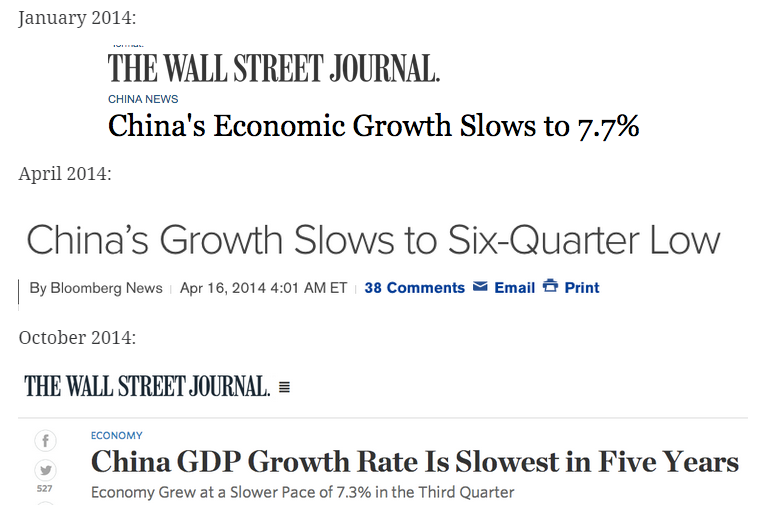 It is usually the stock market leading the economy. To the wealth builders, they might think its the other way. 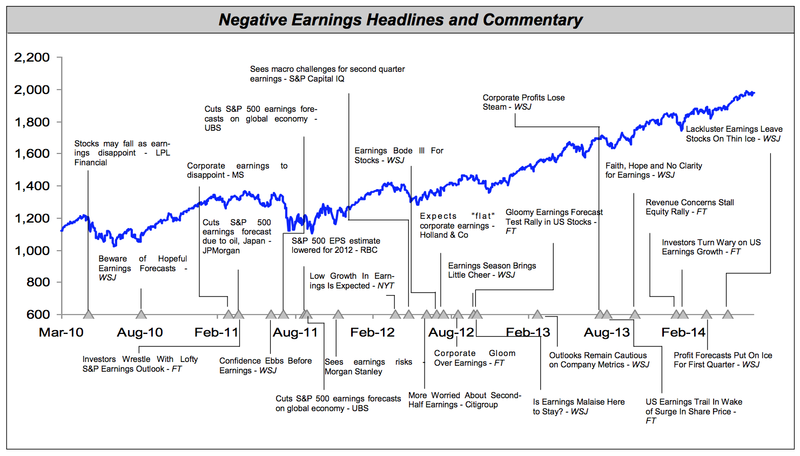 On newspapers and television we will get many news stating the general negative earnings outlook. 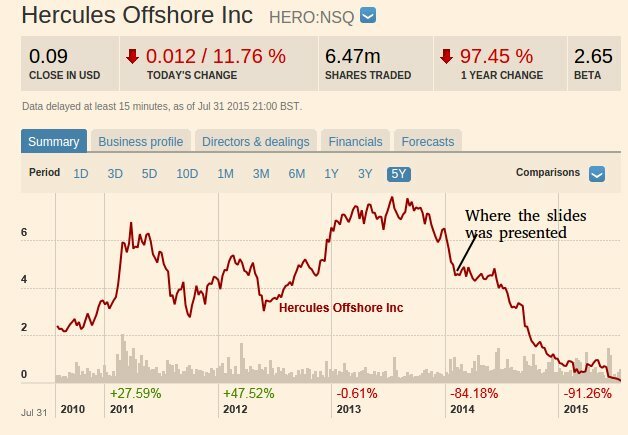 May would use that as a cue to sell off or pare down their holdings. Here is a snapshot courtesy of the Reformed Broker, showing the stock market run up. See whether you an find consistency in using these news as a basis for your accumulation and distribution decisions. Because you are not a professional, you would think the professionals analyse things better than yourself. So you base your wealth building on the outlook of the analysts. The same goes for the management of the company. They should know their company best isn’t it? 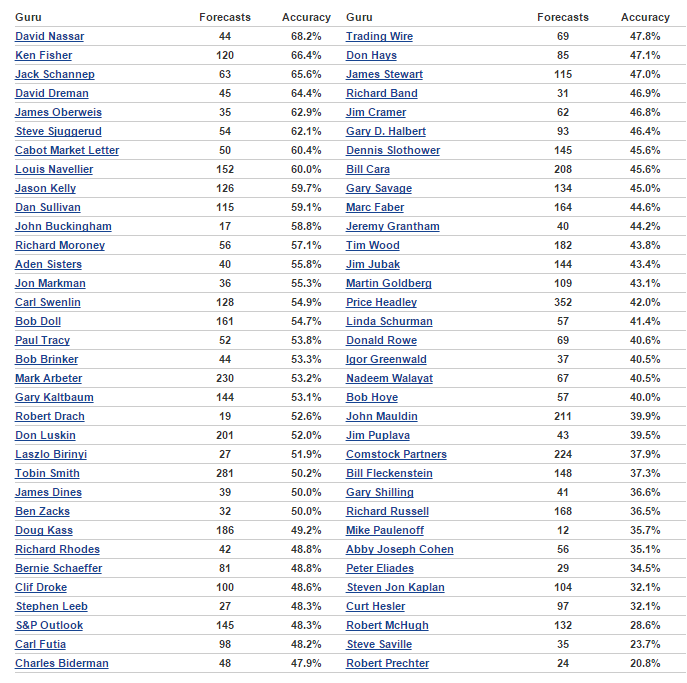 Here is a list of examples that showing basing your wealth building on their calls might be a dangerous game. Does the Data actually mean Anything? We have seen some data points provided in the media showing how bad they are compared to previous historical figures. Here Josh Brown shows that data might look bad, but perhaps if you buy and sell based on this, it might not reflect an outright causation. 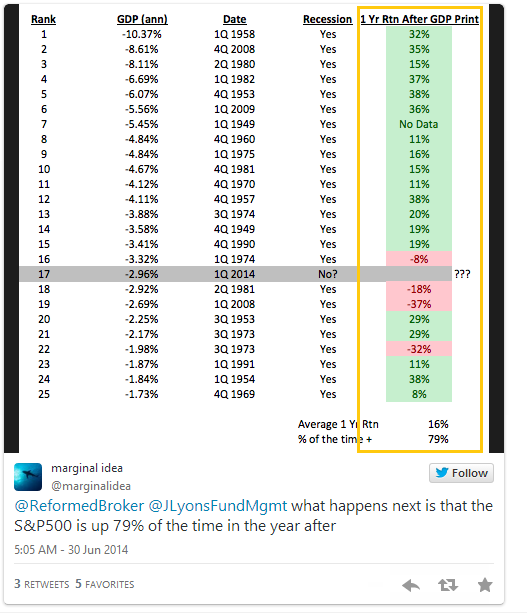 The Twitter account of J. Lyons Fund Management put out a tweet with an amazing table of data they’d created. 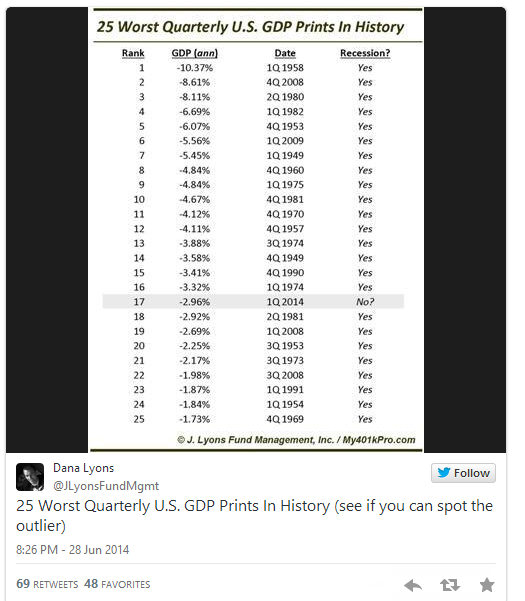 J. Lyons had taken the 25 worst GDP prints in history – in light of this week’s downside shock for Q1′s final revision – and then looked for an example in which these terrible twenty-five hadn’t led to a recession afterward. So it turns out that there has been a recession immediately following each of the 25 worst quarterly GDP prints since the 1940′s – a range in which our Q1 final GDP print of negative 2.9% most assuredly fits. But within a day and a half, a response is created and shared showing that, despite this seemingly dire data set, an even more important statistic is worth considering – the fact that the S&P 500 trades higher 79% of the timeone year after these horrendously recessionary GDP prints. Even juicier is the fact that the average stock market gain in these years turns out to have been roughly 16% – far above the average return of all years, even those in which economic data is robust. Sometimes we take the data and come to our conclusion that it must be right, without verifying it.Most likely because we don’t have the time. Next time, insert a question in your brain asking yourself if this data will lead to the supposed effect at all. Many commentary brought up the data point that the yield curve is about to invert. Yield curve inversion traditionally precedes almost all recessions. However, whether it truly helps investors as a forward indicator of a bear market or the extend of a market draw down, it is pretty useless. 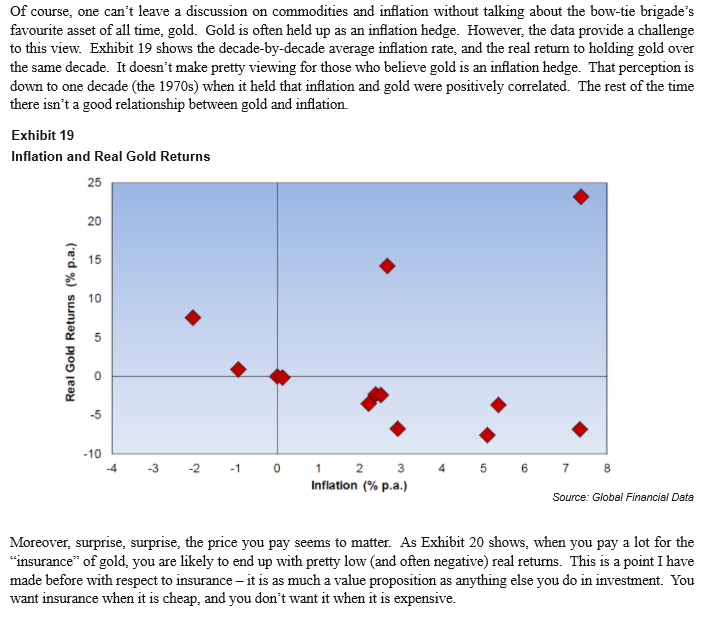 One of the often mentioned assets to combat inflation are the gold and commodities. Gold and Silver, for the matter have created a cult of fervent wealth builders that seem to based the premise for investing in an instrument that does not yield any cash flow. Because of that you need to either hold long and sell off bit by bit when you need, or it is basically a speculation tool. 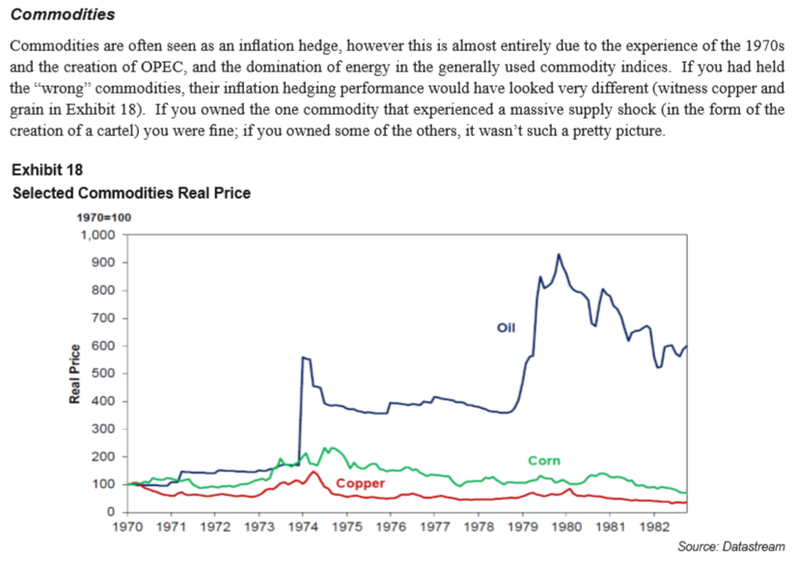 James Montier of GMO wrote in No Silver Bullets in Investing, that if we look at various data points, they might not be the real inflation hedges. The closest litmus test that we encountered was the 1970s, and in that case, we have to make sure we pick the right commodities, in this case, the cause of oil price spikes might be due to supply and demand more than the natural properties. 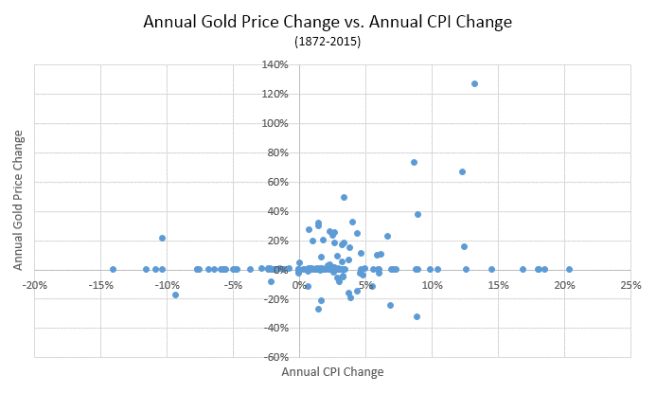 Using Robert Shiller’s inflation data–which goes back to 1871–the correlation between the annual return (price change) of gold and the annual change in inflation has been 0.20. Not exactly high by any standard. 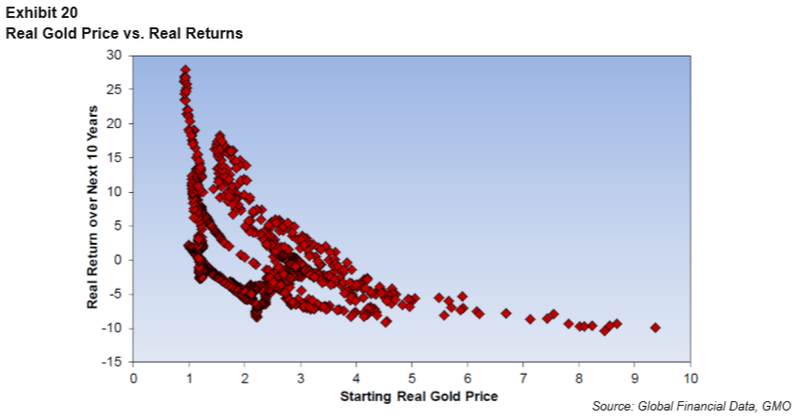 Again, exhibit 19 is rather interesting if you look at decade by decade real (inflation adjusted) returns of gold versus the actual inflation. How do we resolve low to negative inflation yet positive returns, and for the matter high inflation but there are periods of extreme positive returns and negative returns. The thing that gets talked down the most by inflationist is that you have got to own the only real money around which is gold and silver. So you should sell equities. Data points here are interesting in that this is real (inflation adjusted) returns versus the inflation rates. It would seem real returns in various counties including that of Germany who went through hyperinflation, turn out to be positive. As a counter point, perhaps the time duration is too long, in that you will not live for 113 years. In the short run, the results might be vastly different. 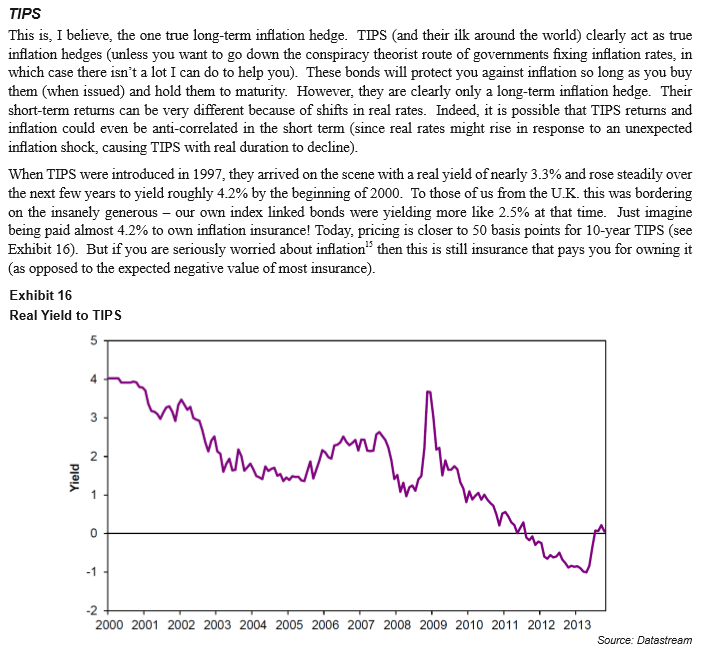 While we are at this, Montier seem to think the good inflation hedge is actually inflation linked bills. 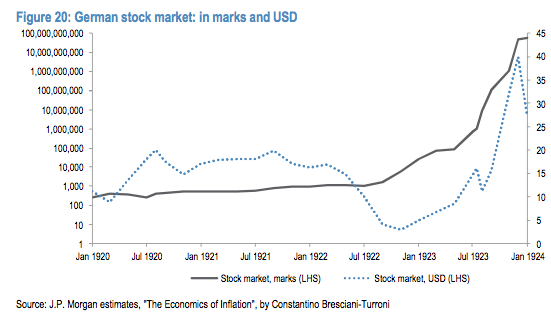 For the period 1928-2013, the average annual compound real return of stocks = 6.3% and gold = 2.0%. However, the price of gold was controlled by the government until the mid-70s when the US finally abandoned the gold standard. 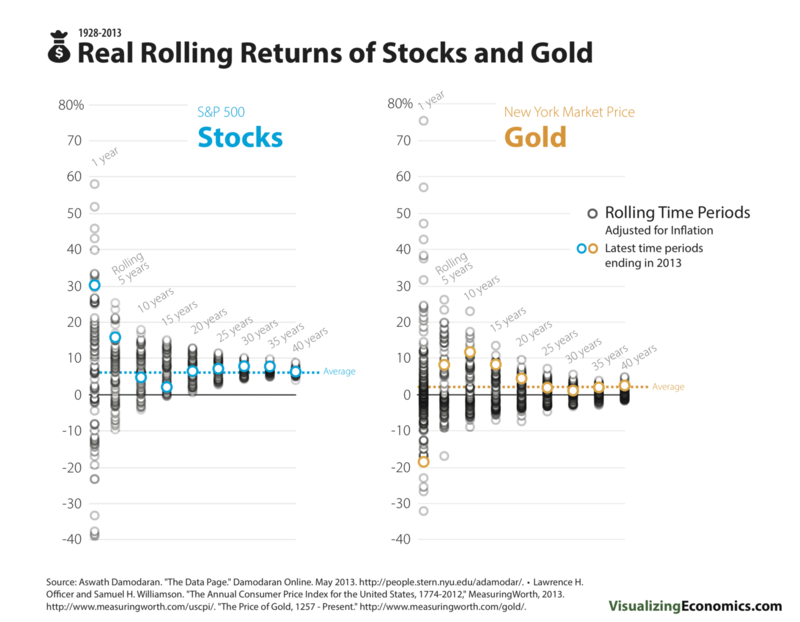 For the period 1976-2013, the average returns were stocks = 7.2% and gold = 2.0%. Bonds tend to drew the most flak for performing worst in a highly inflationary environment. The narrative is that, had you stay in bonds, you will see your purchasing power eroded. What steps should you take in your portfolio if you think inflation is about to heat up? 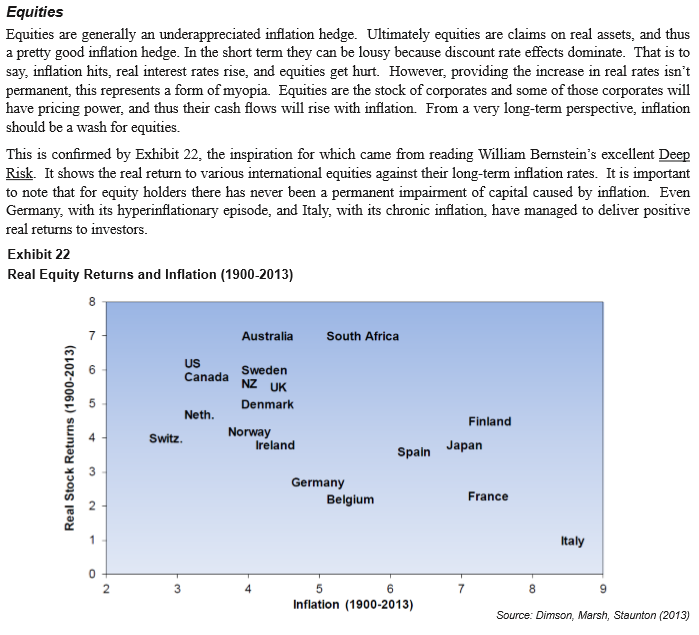 Erb acknowledges that there isn’t a great short-term inflation hedge. But he says that intermediate-term government bond funds should largely hold their own when inflation and interest rates rise, since they can reinvest in higher-yielding issues as their older bonds mature, thereby absorbing the losses of principal caused by those higher yields. Erb points to the surprising resilience from 1966 through 1981 of intermediate-term U.S. government bonds — those with five-year maturities. This 16-year period is often considered the worst environment in recent history for bond investors, since intermediate Treasury yields nearly tripled. Nevertheless, according to Ibbotson Associates data, these bonds produced a 5.8% annualized return over the period. The most popular intermediate-term bond fund, among those advisers monitored by the Hulbert Financial Digest who have beaten the S&P 500 over the past 15 years, is the Vanguard Intermediate-Term Investment-Grade Fund VFICX +0.10% , which charges annual fees of 0.20%, or $20 per $10,000 invested. The persistent news tidbit in the media after a 20 year period where interest rates have been falling have been that, you should get out of bonds because when interest rates rise, you will lose money in bonds. 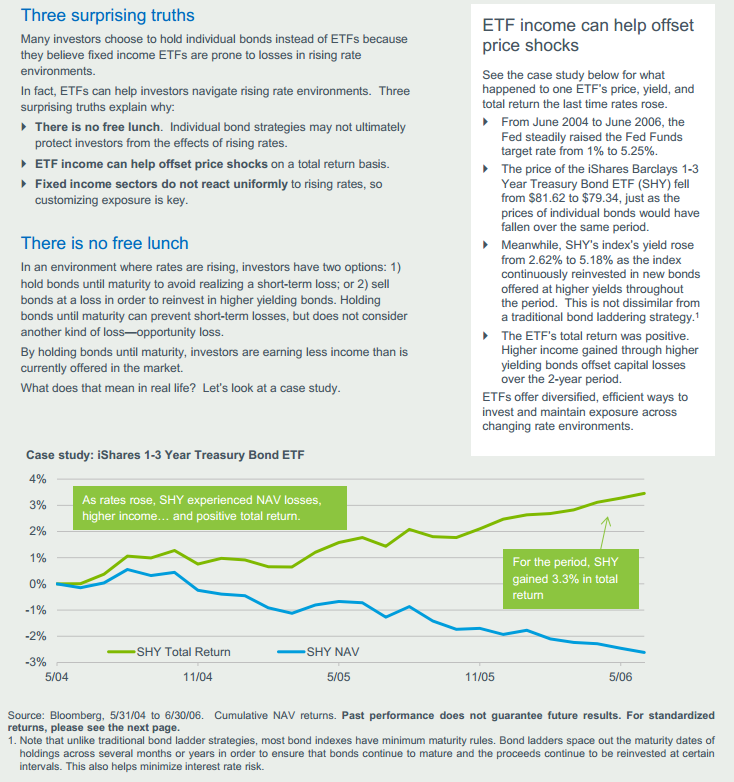 I written an article here talking more about that may not necessary be the case for Bond ETFs, those that held to maturity. 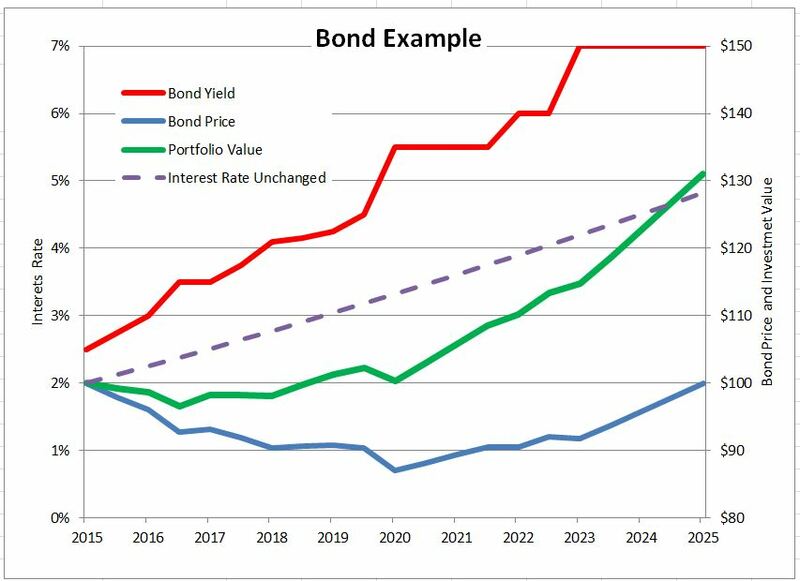 There is little mentioned about how the price of a single bond issue will move throughout the duration of its lifespan. If you hold a bond till maturity, you will not lose money, unless the folks issuing the bond cannot pay (called defaults). Some investors believe that the yield to maturity on a bond measures the return they will earn if they hold the bond until it matures. Not quite. There is a hidden assumption that the coupon payments received every six months will be reinvested and will earn the same rate as the yield to maturity. If it is possible to make money with bonds when interest rates rise, why are so many people worried that rates will rise? The blue line at the bottom of the chart plots the price of the bond for the same time pattern of rising interest rates. Just as the math requires, rising rates mean lower bond prices. At maturity approaches the price approaches the par value of the bond – the principal to be repaid at maturity. If an investor didn’t reinvest the coupons, if instead he spent the coupon income, all he would have at maturity is the par value. Likewise, if the investor had sold out at the low point on the green line (July 15, 2016) the proceeds for the $100 invested would have been $96.50, a loss of $3.50. Good GDP Means Good Stock Market Return? The link between GDP and stock market performance may not be so close after all, and if you based your decision making on the headlines to influence whether you invest or not, it can lead you to make some questionable decisions. Good Profitability Means Good Stock Market Return? In Ben Carlson’s post here profiling how the stock market does when corporate profit growth is good, the data shows over time there is low correlations when profit growth was exceptional it does not automatically lead to great stock market returns. 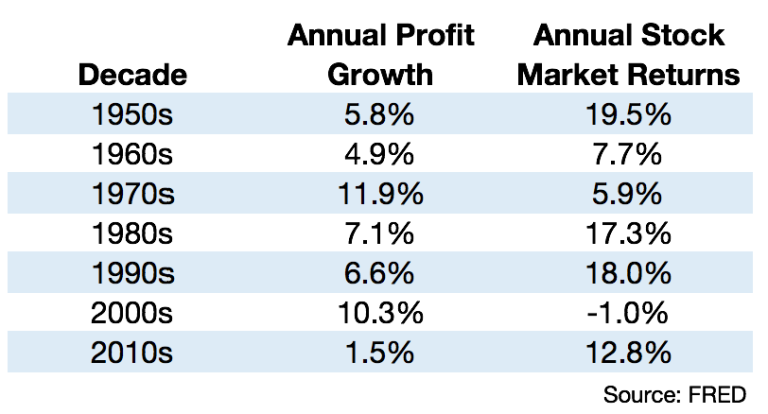 If we dissect based on the type of market, with an emphasis on sideways market, annual profit growth was good but the stock market return differs. Research have shown that finance managers have a hard time doing better than the benchmark set for their investment funds over time. This is true for hedge funds as well. What about how these managers manage their money outside of work? This is the first study to look directly at fund managers’ stock portfolios, real-estate ownership, total wealth, and personality in order to study whether extensive knowledge and day-to-day interaction with the stock market improves one’s personal wealth. The results were striking: The researchers found no evidence that these financial experts make better investments than peers of similar age, income, and education background—casting doubt on how much value is added by so-called expertise. Read Do financial experts make better decisions than the rest of us? One of the prevalent narrative about the USA government is that the government cannot afford the interest on the debt they owe. The second narrative is that, if a foreign country is not happy, they could just sell the USA debt and USA will be in trouble. One of the person who while not a fan of the USA decision makers, tend to provide a realistic interpretation of things. You can take a look at Cullen Roche’s 2 concerns about the USA government debt to see his point of view on why we have misunderstood these worries. Do Like Me on Facebook. Join my Email List. I share some tidbits that is not on the blog post there often. I really wish I had landed here in 2014, or even before. Your blog is just full of awesome breakdowns and analysis. Hi Bob no worries, you can go to the Resources section, the REITs Training Center and Lifestyle Redesign for most of my complete articles.